In the early 1990s, the Western Balkans were the scene of prolonged and bloody inter-ethnic wars. Numerous issues remain unresolved; Bosnia is a dysfunctional state; Kosovo a disputed territory; Macedonia a fragile republic, however, it is hard now to imagine the renewal of inter-state armed conflict. Investigating the causes and mechanisms driving peaceful transformation in the Balkans, this book examines developments in the region and contributes to discussions on security community building. Focusing on how different professional communities work together in the creation of regional peace and security, it sheds new light on how diplomats, policemen, soldiers and others brought about the transformation from conflict to peace through their everyday practices. 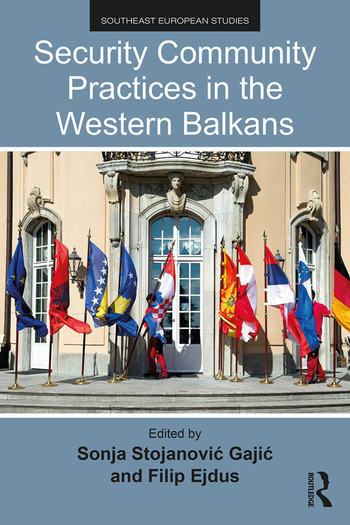 Conducted collaboratively by a research community based within the region, this volume will be highly relevant to scholars and researchers studying the Balkans, regional security, security communities and policymakers. Sonja Stojanovic Gajic is Director at the Belgrade Centre for Security Policy. She has more than fifteen years' experience of working on security sector reform programs with particular focus on police reform, gender and security sector reform (SSR). Her original contribution is development of methodology for measuring security sector reform (SSR) from the perspective of civil society tested in Albania, Bosnia and Herzegovina, Croatia, Kosovo, Macedonia, Montenegro and Serbia. She has published internationally on policing, women, peace and conflict resolution. Some of her recent publications are: Women, Peace and Security in the Western Balkans (ed. with Gorana Odanovic), Policing in Serbia: Negotiating the Transition between Rhetoric and Reform (with Mark Downes) that appeared in the book Policing Developing Democracies (Routledge 2008). Prior to her current post, Sonja had worked for the OSCE Mission to Serbia and Montenegro in the strategic management program for the Serbian and Montenegrin police services. In the period of 2006–2011, Ms. Stojanovic Gajic worked part-time as a teaching assistant for security studies at the Faculty of Political Sciences of the University of Belgrade. Sonja holds an MA in Politics, Security and Integration with distinction from the School of Slavonic and Eastern European Studies, University College London and she is currently a PhD candidate at the University of Belgrade. Filip Ejdus is Assistant Professor at the Faculty of Political Sciences, University of Belgrade. He acquired his Master’s Degree at the Paris Institute of Political Studies (Sciences Po) (2005), at the London School of Economics and Political Science (LSE) (2006) and defended his PhD Thesis in the field of international security at the Faculty of Political Sciences, University of Belgrade (2012). Since 2015, he was Marie Curie Fellow at the School of Sociology, Politics and International Studies, University of Bristol working on a project titled Local Ownership in Security Sector Reform Activities Within CSDP Operations of the EU. In the period January 2007 – March 2009, he was the Executive Director of the Centre for Civil–Military Relations (currently Belgrade Centre for Security Policy) and presently serves as a member of its Management Board. He co-chairs the Regional Stability in South East Europe Study Group (RSSEE) of the PfP Consortium of Defense Academies and Security Studies Institutes. He is the editor of the Journal of Regional Security and author of several books and academic articles in national and international journals in the field of European integration, international relations and security studies.